80-year-old inspires other runners with age-defying vigor. Djamila Grossman | The Salt Lake Tribune Woody Whitlock has run marathons for several years. Now that he's 80 he decided to run eight marathons this year -- one for each decade of his life. 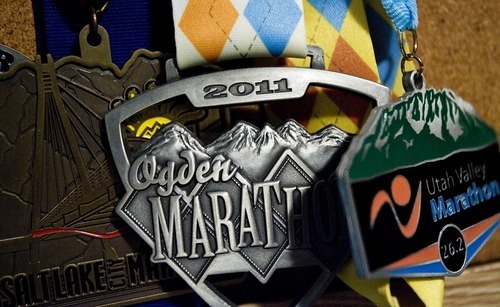 Medals from marathons he's run are pinned to a board at his Farmington home. Djamila Grossman | The Salt Lake Tribune Woody Whitlock has run marathons for several years. Now that he's 80, he decided to run eight marathons this year -- one for each decade of his life. He couldn't do it without the help of his wife, Betty, he says. Djamila Grossman | The Salt Lake Tribune Woody Whitlock has run marathons for several years. Now that he's 80, he decided to run eight marathons this year -- one for each decade of his life. He couldn't do it without the help of his wife, Betty, he says. Djamila Grossman | The Salt Lake Tribune Woody Whitlock has run marathons for several years. Now that he's 80 he decided to run eight marathons this year -- one for each decade of his life. 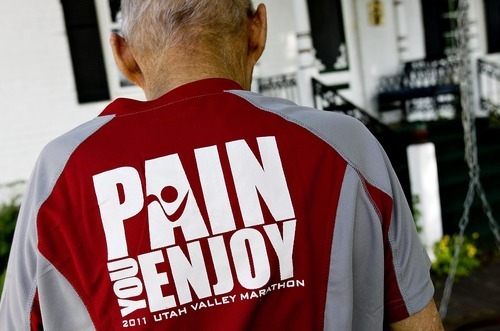 He wears a shirt he received running the 2011 Utah Valley Marathon. Djamila Grossman | The Salt Lake Tribune Woody Whitlock has run marathons for several years. Now that he's 80 he decided to run eight marathons this year -- one for each decade of his life. 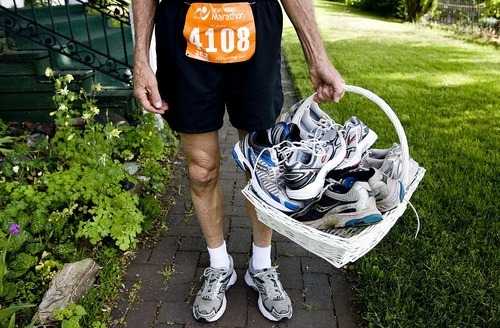 He carries a basket with current and old running shoes at his Farmington home on Sunday. When Farmington's Woody Whitlock completed his first marathon in 1988 at age 57, he felt so badly injured afterward that he said "never again." But after retiring in 2000 from his career as a mental-health therapist, Whitlock picked up running again, and after completing the Utah Valley Marathon on Saturday, the 80-year-old now has 17 marathons under his belt. "Running marathons does everything because it teaches me I have to persevere and be patient," Whitlock said. "Along the way I discovered my own law of divine cooperation. If I am persistent in putting out effort, then God is consistent in putting in the strength  so I always give thanks at the end of every run." When Whitlock turned 80 earlier this year, he made a plan to celebrate life through his passion for running. "I decided I would run one [marathon] each month to celebrate every decade of my life," said Whitlock, who says he also runs to be an inspiration to other guys in and around his age bracket. Whitlock's wife, Betty, said her husband just loves to run and is an inspiration to the entire community in which they live. "Running has been an amazing youth keeper for him, and it's reflected in his whole life," said Betty Whitlock. "He thinks young, he eats properly, he's relaxed and happy and always planning for the next marathon." This year has truly been an epic season for Whitlock, who ran the Salt Lake Marathon, the Ogden Marathon and the Utah Valley Marathon and has five more on the schedule before the season-ending run in Richmond, Va., where he will run with daughter Kitty. 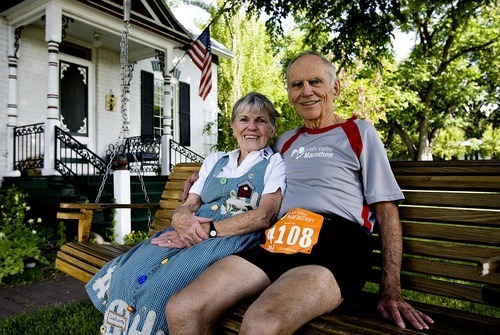 Betty Whitlock says her husband is a superstitious man when it comes to running. "He always wears the same hat, same pants and he has to have perfect shoes," she said. "At the 20-mile mark, he always calls his two daughters, and he carries two Excedrin for his own pain and two Ibuprofen for someone he finds along the course that is hurting." Whitlock said one of the keys to his remarkable run of marathons is simply pacing the body. "I take a kitchen timer with me and set it for five minutes. … When it beeps, I walk for 30 seconds and that allows my body just enough time for recovery," he said. Despite his advancing years, Whitlock said he has no plans of slowing down anytime soon. 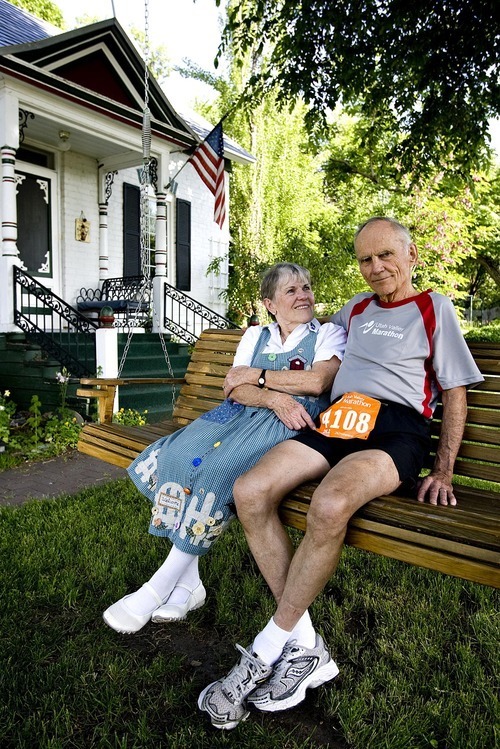 Eighty-year-old Farmington resident Woody Whitlock plans to do eight marathons in 2011 as a celebration of the eight decades he has lived. In 1988, at age 57, Whitlock swore he would never run another marathon. That was 16 marathons ago. When Whitlock broke five hours at the Ogden Marathon earlier this season, he qualified for the Boston Marathon as one of the fastest 80-year-old runners in the United States.